BullGuard Premium Protection is an extremely comprehensive security suite which provides just about everything you could possibly need to keep your PC safe. Naturally, this means that you get all the basics. An antivirus engine constantly monitors your PC for threats; anti-malware protection will safeguard against malicious software, a firewall detects and blocks network attacks; a spam filter keeps your inbox clear, a network scanner checks your wifi for vulnerabilities, while browsing protection alerts you to dangerous websites. But that's just the start. The suite also provides parental controls and social media protection to ensure your kids are safe online; a vulnerability scanner alerts you to outdated software, and a PC Tuneup tool helps to optimise your system's performance (Windows only). Identity Protection options are particularly strong. Give the program your personal details - usernames, addresses, phone numbers and so on - and it constantly searches the web, immediately alerting you via email and by text if anything is made public. This feature is currently only available to US, UK, Canada, Denmark, Germany, France, Ireland and Netherlands residents. And you probably won't have to spend any time wondering where you'll be able to install it, because the suite comes with a 10-device licence as standard, supporting Windows, Mac and Android devices. 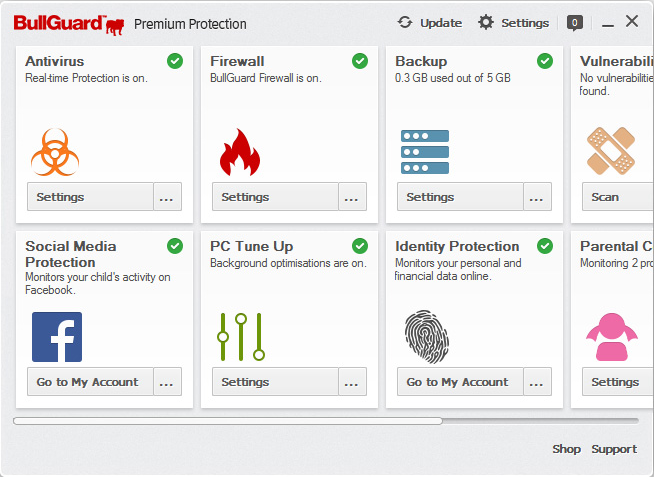 BullGuard Premium Protection may not be the cheapest security suite, then, but you get a lot for your money, and a clean and accessible interface ensures the suite's many features are very easy to use. If you're looking for a do-everything security suite which has plenty of power, but won't drown you in jargon, then Premium Protection needs to be on your shortlist.